Frame Rate Converter - Change Frame Rate among 23.97, 29.97, 30fps etc. There are many different frame rates, 24fps, 23.97fps, 30fps, and more. And there will be times when you need to use frame rate converter to change multiple video frame rates to match each other for editing, playing, uploading, or burning into DVD disc etc. However, converting video frame rate can be challenging. Many throw annoying audio or video side effects, for example, "I always strayed away from FPS conversion as they always threw the audio out of sync", "I'm trying to convert 29.97fps YouTube videos to be more PAL-friendly for PAL playback/display devices, but I get a very jerky, or blurry video output". The good news is that you have a number of frame rate changers to free download. Without further ado, we pick out the most reliable frame rate converter for you, together with a guide on how to convert frame rate of MP4, AVI, MOV, MKV etc. among 23.97fps, 24fps, 25fps, 30fps, to name a few. 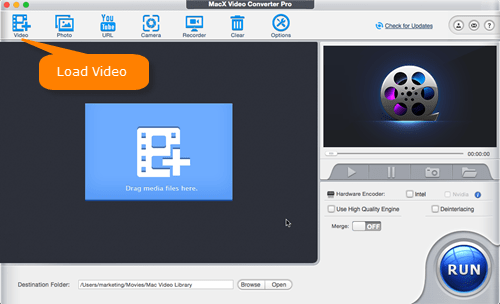 MacX Video Converter Pro is quite a popular video frame rate converter among video enthusiasts. 1. Change frame rate among 23.97fps, 25fps, 29.97fps, 30fps and more in batch, such as 30fps to 24fps, 60fps to 30fps. 2. Support to convert frame rate of MP4, AVI, MOV, MKV, WMV, Apple ProRes, and tons of other formats. 3. Modify video frame rate with high quality output thanks to High Quality Engine. No audio video out of sync, blurry video problem. 4. Convert fps smoothly and quickly, 5x faster than free online fps converter, thanks to multi-core processing and QSV tech. 5. Change video format as you wish when changing video fps, like MP4 to MOV, MKV to MP4, MOV to AVI, to name a few. 6. Compress video file size with up to 80% compression ratio with good quality maintained. 7. Edit, customize and enhance your video file, adjust other video parameters like bit rate, resolution, audio channel, sample rate. 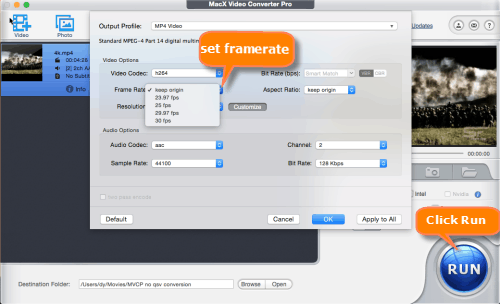 Run the video frame rate converter if you've downloaded it for Mac or for Windows. Click Add Video button at the top left corner of the main interface, choose source video file from the popping up window, and the video will be loaded quickly. You can also directly drag drop files to the window. You can add more than one source video at a time. The fps converter software also works as a video converter for Mac/Win that accepts a wide range of codec and container formats, such as MP4, H.264, H.265, MPEG4, MOV, AVI, WMV, MKV, FLV, VOB, AVCHD, Apple ProRes, and many more. An Output Profile window will pop up when the source video is loaded successfully, allowing you to convert video formats. The frame rate converter can change among various video formats, select your ideal format and click OK.
Click settings icon on the right of the video info, you'll see a window with Output Profile, Video Options and Audio options. Head to Video Options, click the menu next to Frame Rate, and pick the frame rate you want. Click "OK" to save the settings, (Know more about 30fps vs60fps). In the meantime, you can compress video size, convert bitrate, change video codec, modify aspect ratio, convert video resolution, adjust other video audio parameters and merge/split video files with the all-around frame rate changer. After you've all set, click "RUN" button on the bottom right corner to start lossless video frame rate conversion. It's not good to convert frame rate to a lower one, for example 30fps to 24fps, because you may lose motion information contained on these frame rates you throw away, which will result in video stuttering/jerky playback. We always use frame rate converter to change the lower frame rate to the higher one. If you have to reduce frame rate, make sure that you convert A to B, and A can evenly divide by B, for example, convert 60fps to 30fps, 120fps to 60fps, to avoid jerk/messed video audio or other problems with output videos. What Frame Rate Should You Use? Since there are many different frame frames, it may be difficult for some users to decide which frame rate to choose. If you are one of them, read our tips on what frame rate you should use for YouTube, mobile devices, DVD burning etc. 1. Best frame rate for YouTube - To convert video frame rate for uploading to YouTube, Facebook etc. online, you should know that common frame rates for YouTube include 24fps, 25fps, 30fps, 48fps, 50fps, 60fps. And YouTube also accepts other frame rates. It depends on what effects you want to get. However, interlaced video should be deinterlaced. 2. Best frame rate for games - Your eyes can tell the differences between 30fps and 60fps. 30fps is playable and smooth (no lag). 3. Best frame rate for mobile devices - When change frame rate with frame rate converter for Android mobile devices, iPhone etc, you won't go wrong with 30fps. iPhone and many other phones and tablets support to play or record video at 30fps. But make sure that the fps you set is as low as looking good. 4. Best frame rate for DVD burning - If you convert frame rate for burning a PAL DVD, you should change video frame rate to 25fps. While NTSC video frame rate is 29.97 fps. NTSC system and PAL system are not compatible with each other. 24fps, a widely accepted frame rate for digital filmmaking. It keeps a good balance between image quality and the fluidity of film. 23.98 fps, it's compatible with NTSC devices. Many HD video formats and some SD formats are recorded at 23.98fps. 29.97fps, it's a NTSC standard. If you need to use frame rate converter to modify fps for NTSC devices, NTSC DVDs, choose 29.97fps. 30fps, Some HD cameras support to shoot videos at 30fps. But Blu-ray disc and DVDs don't accept 30fps. 60fps, 59.94fps is always referred to 60fps. Most HD devices can play and record videos at 60fps. But 59.94fps is a more common since 59.94 is compatible with NTSC. Free download the best frame rate converter - MacX Video Converter Pro to fast convert frame rate for MP4, MOV, MKV, AVI, WMV etc. among 23.97fps, 25fps, 29.97fps, 30fps, 60fps with good quality.